A chemical system developed by researchers at the University of Illinois at Chicago can efficiently perform the first step in the process of creating synthetic gasoline (syngas) and other energy-rich products out of carbon dioxide. 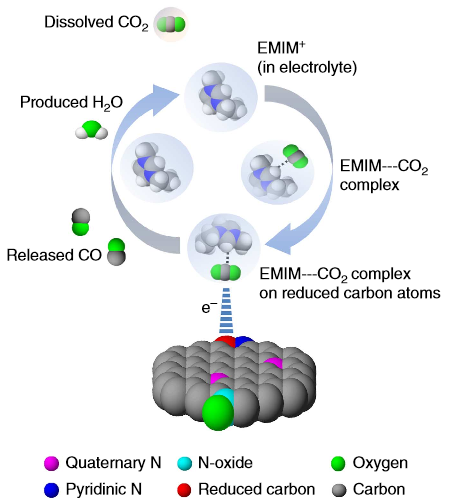 The key to the new process is a novel “co-catalyst” system using inexpensive, easy-to-fabricate carbon-based nanofiber materials that efficiently convert carbon dioxide to carbon monoxide, a useful starting material for synthesizing fuels. The findings have been published online in advance of print in the journal Nature Communications. “I believe this can open a new field for the design of inexpensive and efficient catalytic systems for the many researchers already working with these easily manipulated advanced carbon materials,” says Amin Salehi-Khojin, UIC professor of mechanical and industrial engineering and principal investigator on the study. Researchers have spent decades trying to find an efficient, commercially viable first step to chemically “reduce,” or lower the oxidation state, of carbon dioxide to allow for efficiently synthesizing gasoline. Reducing carbon dioxide is a two-step process, but chemists had commonly used only a single catalyst, Salehi-Khojin said. So he and his colleagues experimented with using different catalysts for each step. In previous work, Salehi-Khojin used an ionic liquid to catalyze the first step of the reaction, and silver for the final reduction to carbon monoxide. The co-catalyst system was more efficient than single-catalyst carbon dioxide reduction systems, he said. But silver is expensive. So he and his coworkers set out to see if a relatively new class of metal-free catalysts — graphitic carbon structures doped with other reactive atoms — might work in place of the silver. They tried a common structural material, carbon nanofiber, which was doped with nitrogen, as a substitute for silver to catalyze the second step. When these carbon materials are used as catalysts, the doping atoms, most often nitrogen, drive the reduction reaction. But, through careful study of this particular reaction, the researchers found that it was not the nitrogen that was the catalyst; it was the carbon atom. “Further, one can imagine that using atomically-thin, two-dimensional* graphene nano-sheets — which have extremely high surface area and can easily be designed with dopant atoms like nitrogen — we can develop even far more efficient catalyst systems,” Kumar said. “If the reaction happened on the dopant, we would not have much freedom in terms of structure,” said Salehi-Khojin. In that case, little could be done to increase the efficiency or stability of the reaction. But with the reaction happening on the carbon, “we have enormous freedom” to use these very advanced carbon materials to optimize the reaction, he said. The researchers hope that their research leads to commercially viable processes for the production of syngas — and even gasoline — from carbon dioxide. 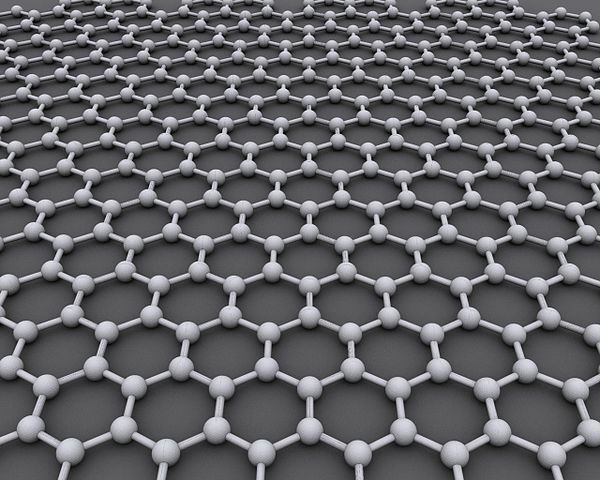 * Would a 3D version of graphene also be useful to explore, as in this use as a catalyst in solar cells? The development of an efficient catalyst system for the electrochemical reduction of carbon dioxideinto energy-rich products is a major research topic. Here we report the catalytic ability of polyacrylonitrile-based heteroatomic carbon nanofibres for carbon dioxide reduction into carbon monoxide, via a metal-free, renewable and cost-effective route. The carbon nanofibre catalyst exhibits negligible overpotential (0.17 V) for carbon dioxide reduction and more than an order of magnitude higher current density compared with the silver catalyst under similar experimental conditions. The carbon dioxide reduction ability of carbon nanofibres is attributed to the reduced carbons rather than to electronegative nitrogen atoms. The superior performance is credited to the nanofibrillar structure and high binding energy of key intermediates to the carbon nanofibre surfaces. The finding may lead to a new generation of metal-free and non-precious catalysts with much greater efficiency than the existing noble metal catalysts.